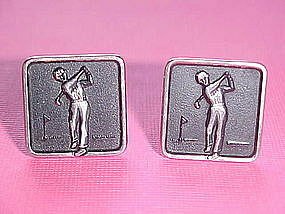 Wonderful pair of Men's golf cufflinks featuring a golf ball flanked by a wood and a putter in Excellent condition. Circa 1960's. 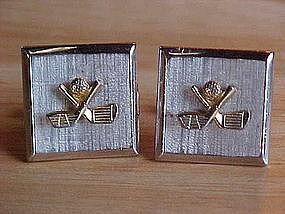 Each cufflinks face measures about 7/8" X 7/8". Interesting pre Columbian design influence pin made of sterling silver with 18k gold and hand painted enamel work. This pin is signed, " 925 18K." It was made in Peru by Native craftsmen. There is some gold worn off in tiny spots but gives it age character otherwise it is in great shape. 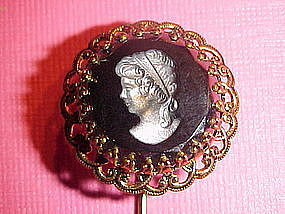 This pin measures 1 1/2" in diameter. 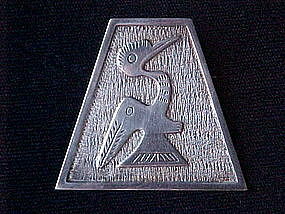 Unusual hand crafted silver mystical double headed bird pendant. 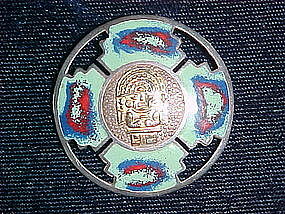 This pre Columbian influenced design pin is made of .900 Silver. 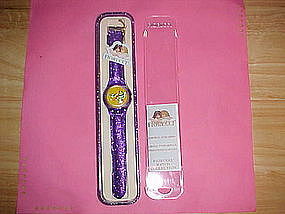 It is signed " 900 ECUADOR." It is in beautiful condition and measures about 1 1/2" long and 1 5/8" wide. 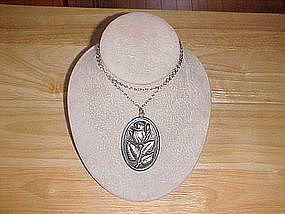 Beautiful sterling silver Rose flower pendant signed with the hallmark of the International Silver Company. It is in very good condition and measures about 2 3/8" long X 1/2" wide. A great gift for the Rose lover. This Rose never wilts!!! 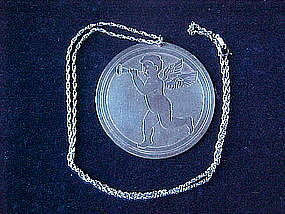 Beautiful sterling silver pendant that was converted from a ornament featuring a Cherub blowing a horn. 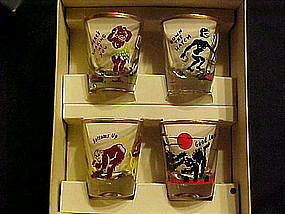 It is signed, " 1972 S. Kirk & Son Sterling." It comes on a 24" sterling silver chain. The pendant itself measures 2 1/2" in diameter. This beautiful pendant can be worn anytime. A great gift for Angel lovers. Wonderful enamel fish pin. 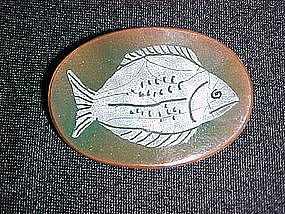 This 1950's pin is a hand painted enamel fish on a copper base. It is in fine condition and measures about 1 1/2" long and 1 1/8" wide. It's a beautiful folk art fish portrait pin. Beautiful vintage silver toned bracelet. 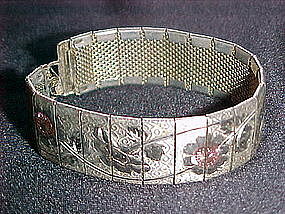 This 1950's bracelet consist of 21 etched metal panels forming a lovely floral scene. This bracelet is done so well that people will think it is either fine silver or white gold!!! It is in very fine condition and measures about 6 7/8" in length and 3/4" wide. Nice retro creation by CORO. 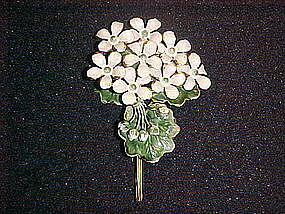 This pin is signed " CORO Sterling " and it measures about 3 1/4" long. 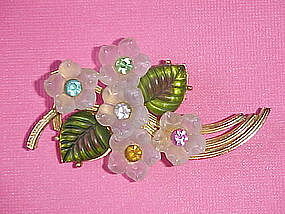 It has three stylized blooming flowers, each with a green rhinestone center. 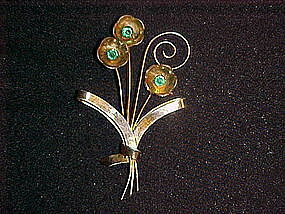 This is a vermeil pin and it is in very good condition. 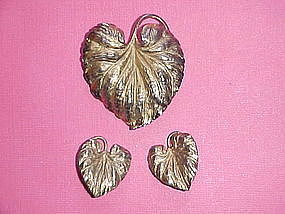 Fabulous vintage silver Napier jewelry set. These leaves are so detailed that they are actually miniature silver sculptures that you get to wear!!! The pin is about 2" long and 1 5/8" wide and weights approximately 1/2 troy oz.!!! The earrings are clip ons and each one is about 1" long. All three pieces are signed "NAPIER STERLING." They are in fine condition!!! 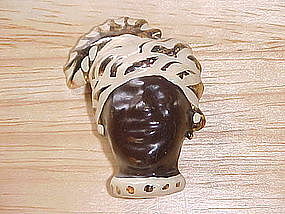 Fabulous Blackamoor pin vintage 1930's-40's. This pin in made of a composition material. It is all hand painted and in fine condition. 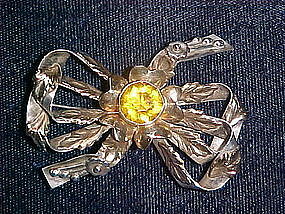 This fine deco piece measures about 1 5/8" long and over 1 1/4" wide. 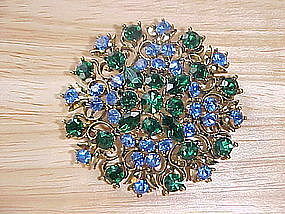 Beautiful vintage dual color Rhinestone pin. This super pin tapers out the form a emerging mountain of sparkling rhinestones!!! It is signed " LISNER " and is about 2 " in diameter. It is in extra fine condition!!! Just Beautiful!!! Circa 1960's.